This is a picture of Grandma Esther with me sitting right next to her on the sofa, Kim standing in front of me and Selena on her right. 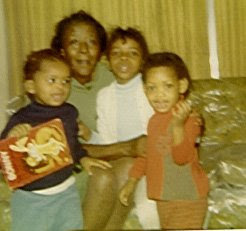 We Love and Miss You Granny!!!!!!!!!!!! This week is the birthday of both of my grandmothers. Esther Ryals was born November 27th, 1907 and would have been 101 years old if she had still been here with us today. Irene Keitt passed a little over a month before her 95th birthday, which was on November 24th. During the thanksgiving holidays we would always celebrate their birthdays together with dinner and a large birthday cake. We have not done that for sometime though. Esther has been gone since 1990 and about four years before she passed on she was in Hilhaven Nursing Home. The last 7-8 years of Irene's life she suffered from Alzheimers. I feel very fortunately to have had these two amazing women in my life, they both gave me something very different that molded who I am today, besides genetics that is. I so often find myself quoting my grandma Esther,from all of the little sayings that she had, but there is one that continues to resonate even more now than before. When she would tell me things about life or when things would happen in my life, and I couldn't quite grasp what she meant, she would always say, "Just keep living", and the more that I grow and the older that I get, I understand exactly what she meant. Oh wow, I am getting old. I find myself telling my daughter the same thing all of the time, because we always think that we have a handle on life in our 20's. We believe that we have all of the answers, now that we are all grown up, NOT. At 20 you know absolutely nothing, but "just keep living" and you discover how little you did know. Esther gave her grandchildren all that she was and all that she had. She spent a great deal of time with each and everyone of us. She knew what our special foods were and she always had them at her house for us when we came by even though she didn't drive or go many places without at least one of her daughters. She told us stories of her childhood, and since she was one of thirteen children she always had a story to tell. She would often tell us stories of our own mothers, which were her daughters, and of course we thought they were the greatest and the funniest. One of those last special times for me was when I was pregnant with my daughter Whitney, and she stayed at my parents house before going to the hospital as her health deteriorated and eventually going into the nursing home. We would sit around my parents house and look at all of the baby clothes and she would tease me that the clothes were going to be dirty before the baby was born because we were constantly handling them. At one point during my pregnancy I was craving fried fish and she would insist that my mother go to the store for her and buy fish so that she could fry it for me. These are the things that I remember the most. We would always just talk about everything and anything, this is something that I would never forget about her, she was never too busy for us, and whatever we had to say was of utmost importance. Her passing on was the toughest lost that I have experienced thus far, when they lowered her casket in the ground my knees weakened, and at that moment it hurt so very much. I have never stopped missing her and I talk about her often, almost daily, even after 18 years. By the time my daughter was born Grandma Esther was already in the nursing home and her health rapidly deteriorating, so Whitney never got to know her. But you would not be able to tell that from talking to my daughter, we kept Grammy alive all of these years because we talk about her so often. Whitney tells stories about her as though she got them straight from the horses mouth, but it was all second hand information. Unknowingly, we made her a living person for my daughter as with the rest of her great grandchildren, by keeping her alive in our own worlds, not being aware of the impact. My daughter has truly missed out on something extraordinary by not getting to know her great grandmother, but she is fortunately enough to have a grandmother of her own that she loves very much and who loves her, and a great deal of people never have that blessing. She may not have know my grandmother, but she is blessed with her own.